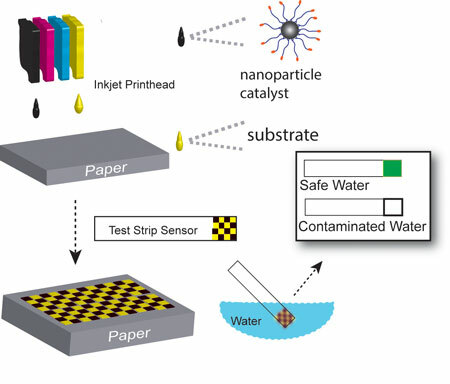 (Nanowerk News) Today the National Academy of Sciences announced a three-year, $271,930 grant to chemist Vincent Rotello at the University of Massachusetts Amherst to develop, test and deploy new, sensitive, reliable and affordable inkjet-printed, nanoparticle-based test strips for detecting disease-causing bacteria in drinking water, with researchers at the Lahore University of Management Sciences (LUMS), Pakistan. UMass Amherst chemist Vincent Rotello, with researchers in Pakistan, is developing and testing sensitive new nanoparticle-based test strips printed on an inkjet printer for detecting disease-causing bacteria in drinking water. They hope the invention will improve the health of millions around the world.